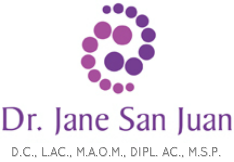 Dr. Jane san juan, dc, l.ac., m.a.o.m., dipl.ac., m.s.p. Dr. Jane San Juan received her Doctorate of Chiropractic and Master of Acupuncture & Oriental Medicine from Southern California University of Health Sciences, as well as a Master in Spiritual Psychology from University of Santa Monica. Dr. Jane is a heart-centered practitioner who believes and promotes the "whole being" integration and the awareness that Wellness is a result of structural and chemical, as well as mental, emotional, subconscious, spiritual, and financial harmony. She is an ﻿authorized Tapping Into Wealth EFT Expert Coach﻿, a certified Labyrinth facilitator, and a Mandala painter. She is currently working on her book project. She has been a guest speaker on telesummits and facilitated multiple workshops about "Toxicity in America and Cleansing Diet", "Zero Point Energy Wand", mandala painting, labyrinth walking meditation. James is Dr. Jane's office manager and the official master wand-er. James earned his B.A. in Theater from University of Southern California. He is a trained voice-actor, a self-taught brew master and a comic at heart. He is also a sports writer for the online Communities Digital News. James is Dr. Jane's significant other. I want to share my deep gratitude for the wonderful healing I experienced from your work. As you know, I saw you 3 days before I took off on a grand adventure to Nepal. Our single session together cleared up tension in my hip, my neck and my back. Before my trip, I was concerned that my pains would get worse from all of the outdoor exercise I had planned. It turned out that you healed me to such a level that I traveled pain free, including a 36 hour flight, a 2 day bus ride and a 10 day rafting trip. The real test came when I paired up with a professional athlete from the North Face and did an 8 day trek in 4 days!Since returning from this trip, I am still pain free in my hip and lower back. I have gone to many different types of healers and so far you are the best… One you told me that I had a “healthy back”, I immediately started taking better care of myself. I had always assumed that my back was a bit damaged and would never have called it “healthy.” Thank you so much for restoring my belief in non traditional healing and my ability to go on these types of outdoor adventures that I love so dearly. I’ve been to many different chiropractors, over a span of 30+ years. Dr. San Juan is so much more than “just” a chiropractor, I hardly know where to begin. A holistic practitioner in the fullest sense of the word! Combined with SOT chiropractic, vector point & cranial therapy go far beyond the treatment one gets at a traditional chiropractor’s office. Combine that with Acupuncture (Dr. San Juan holds a Master’s in Acupuncture and Oriental Medicine) and her amazing array of techniques for treating the entire body, and the result is light years ahead of any treatment I received before becoming a patient of Dr. San Juan. She is my primary care doctor! Yeah, I’ll still go to Kaiser if I break a leg or something, but it’s my visits to Dr. San Juan, about once every 4-5 weeks, that keep me healthy! I highly recommend her. You will find her to be caring and empathetic, and she will patiently listen to and address all of your concerns. I’ve been her patient since 2006. If she moves, I’m moving to wherever she goes! I have been a patient of Dr. San Juan since she started her practice in Santa Monica. Her approach has been very effective for me to say the least and is unique from the other chiropractors who previously treated me. She personalizes the treatment to each patient and takes time to work out the knots in the muscle which is very helpful. I find the Vector Point Cranial chiropractic to be quite effective. I regularly receive both chiropractic and acupuncture each time I go in every 4-5 weeks, and my health and outlook in life has improved a great deal. I have been going to Jane for the last 5 years. I have been to many different body workers, healers and chiropractors. Jane is tops. I love how much time she spends with me. I also love how much she truly cares about my healing. Every visit feels like a home visit. Many bigger offices I have been to, leave you feeling like you are a transaction rather than a person. With Jane, I always feel like I am her most important patient. Jane is very skilled and does so much more than the usual crunch and munch Chiro visit. Thanks for putting me back together Humpty Dumpty when I fall off of the wall. Dr. Jane is the best chiropractor I’ve ever been to for many reasons. I’ve seen chiropractors since I was 16 (so about 20 years) but I was really happy once I found Dr. Jane and I won’t see another chiropractor again. I also get acupuncture from her which I love, especially her dual sessions of chiropractic and acupuncture back-to-back are deeply healing. Dr. Jane approaches all aspects of my wellness in a holistic manner and I feel like she cares deeply about her patients. She is very professional, well-studied, has many degrees and is on the leading edge of understanding a variety of approaches and tools to healing. She also takes time with me and addresses my needs and questions. I have felt rushed before in the past with chiropractors spending 5 – 10 minutes cracking my back and sending me on my way. Dr. Jane is different and the sessions are long and work the entire body. I feel amazing for many days afterwards and not just a couple of hours. I highly recommend her work. Our websites were formerly known as DeserveWellness.com and MindRemastered.com Both websites have been combined into DrJaneSanJuan.com for simplicity and better intergration.